The Old Bell Guesthouse01485 601156work Guest HouseSandra and Bob look forward to welcoming you to The Old Bell at Grimston and providing Bed & Breakfast with optional evening meal in the conservatory restaurant or a drink in the cosy licensed bar. 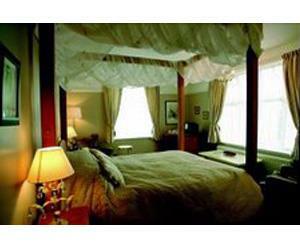 Double room upstairs with four poster and en-suite bathroom. Twin room downstairs with en-suite shower room. Grimston gives you an ideal base from which to explore the surrounding areas which will appeal to both walkers and sightseers, who can take to miles of footpaths and tracks. Grimston lies on the Icknield Way and is close to the Peddars Way and offers a variety of pastimes for all guests. Bird watchers have a choice of the Snettisham and Titchwell RSPB reserves which are only a short drive away as well as Roydon Common which is famous for rare wintering birds of prey and Massingham Heath lies within 2 miles of the Old Bell. The historic port of King's Lynn has a wealth of medieval and Georgian buildings and is situated only 8 miles away while Castle Acre with its ancient Priory and Castle Rising with its moated castle are within easy reach. Sandra and Bob look forward to welcoming you to The Old Bell at Grimston and providing Bed & Breakfast with optional evening meal in the conservatory restaurant or a drink in the cosy licensed bar. From the King's Lynn bypass take the A148 signed Fakenham. After 200yds take 1st right signed Grimston. Follow the road to a crossroads. The Old Bell Guesthouse is in front of you on B1153.